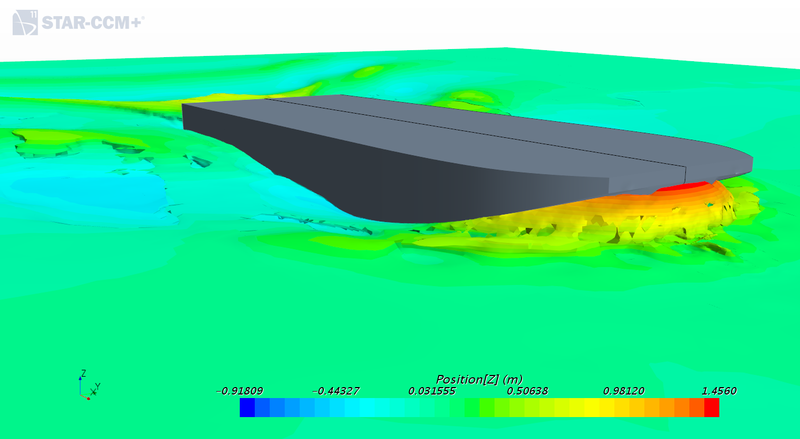 The Shearer Group, Inc. provides Computational Fluid Dynamic (CFD) methods to estimate ship hull performance in calm waters. We utilize Orca Marine’s CFD software program to conduct resistance studies on vessel hulls of all forms. This is especially useful when looking to optimize the vessel’s hull form to improve fuel economy. The difference in a few percentage points of resistance can lead to significant savings for vessel operators over the vessel’s life. We have used our CFD capabilities to conduct comparative studies of barges, tugs, towboats, and ATB units. From these studies, hull form was able to be optimized to provide vessels with good flow and resistance characteristics. Additionally, The Shearer Group, Inc.’s CFD capabilities allow for efficient and accurate powering prediction at early stages of vessel design to ensure the vessel will meet design speed requirements. Heave, pitch and trim characteristics are able to be defined, and the vessel’s wake profile is able to be visualized and analyzed to ensure that a vessel’s behavior is as envisioned by operators without having to conduct model basin tests.